Steven Pitman & The Celebrations. Experience this brand new show that fuses two of Elvis' milestone concert performances into one unforgettable event. Coming on the 21st of March 2014 to the Trifolion in Echternach (L). For more details click here. Ed Bonja was Elvis tour manager and official photographer from 1971 until 1977. He attended both the "Aloha from Hawaii" and "Madison Square Garden" shows. During his time working with Elvis, he was able to capture him both on and off stage in thousands of beautiful photographs. 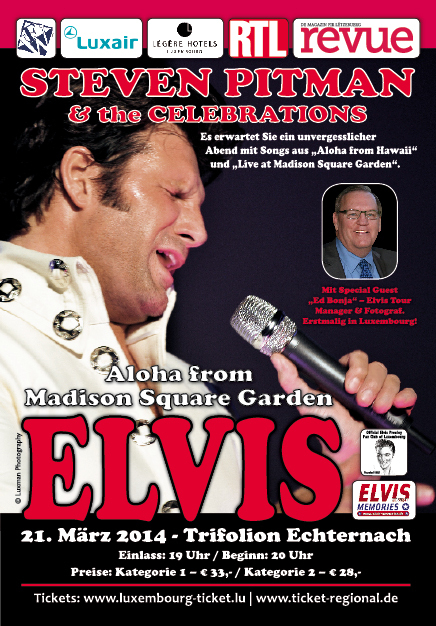 We are very proud to announce that Ed Bonja will be our special guest at the "Aloha from Madison Square Garden" show. He will have some of his photos with him for purchase and he'll be glad to sign them for you. In June 1972 Elvis Presley sold-out 4 straight concerts in 3 days at New York's Madison Square Garden. 80,000 tickets were sold in just two days and the New York Times described Presley as "Prince from Another Planet". "Aloha from Hawaii" was broadcast live via satellite to over 40 countries around the world. The concert took place on January 14th, 1973 in Honolulu and, was until then, the most expensive TV production ever costing over $ 2.5 million. It is said that the concert was viewed via satellite by somewhere between 1 and 1.5 billion viewers. Now Steven Pitman, one of the most sought after Elvis Presley Tribute Acts in Europe is introducing his brand new show production and has merged two of Presley's milestone performances into one unforgettable concert experience. Along with his excellent band "The Celebrations", Steven gives a credible tribute to Presley's concert highlights - always with his own personal touch and without trying to be "the King".